Where did this all start? I’m asked questions like this quite often, perhaps when I guide families on a walk, show children how to light a fire, or by adults who feel a kindred spirit attempting to escape! 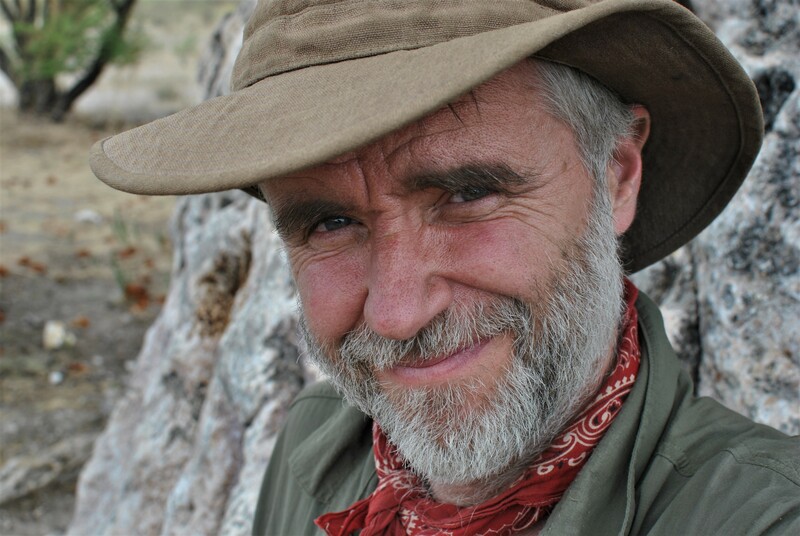 My answers vary, but mostly they focus on studying Bushcraft, reading books, courses attended, leadership training and assessments, all over the past 15 years. But I’m not sure this is where it all truly began, so I’m going to begin at the beginning and we’ll see where this journey ends! From time-to-time a friend would join me, we’d hatched a plan to build a camp in the woods. It would be our secret base, hidden from all the grownups and with luck no one would find us or at least that was how we saw it. We were given some old wooden garage doors by a neighbour, it was such a wonderful gift and our friendly benefactor could see how much we relished in how they would add to our base in the woods. We struggled to drag the doors to our camp, propping them up length-ways between the trees to make walls and then lifting the remaining doors, to perch them on top to make a roof. Reading this again, I guess our neighbour must have had a double garage, we had four doors with which to build our camp. It created a great place to play, even when the weather was miserable and rained. We had no idea what the names of those trees were, they were simply thought of in terms of what we could do with them, could we climb or use their branches for our camp or sticks for making weapons to repel our enemies (whoever they were – children from a different area who thought ill of us perhaps). With my friend now on his way home, I would stay out in the woods, sitting in our camp, under the roof made from those garage doors. I wonder what I thought of and what that young boy, yet to meet his 9th birthday, was thinking about, alone in the camp beneath that great tree, with its branches reaching out protectively across the sky! This was a time of curiosity, finding and watching bugs make their homes and hunt for food. Scavenging for things, we learnt through play, building structures, and making things, improving them when they fell down or broke. We found our way around the woods, developing early navigation skills that meant we found our own way home (eventually)! At the weekends and holidays, my friend and I would cycle to other woodlands. My favourites were Black Park and Burnham Beeches, neither more than a few miles away. It was just normal back then to jump on our bikes and go off to the woods. Our bicycles gave me and my friend the means to escape and explore other places. My mother would have horrified, if she’d seen us exploring the drainage tunnels under the M40, to the West of London, while it was being built! Mum would sometimes take my sister and I to Black Park, we would climb through the rhododendron bushes and mum would buy us a Zoom or Fab ice lolly from the rickety old cabin. Then we set off to walk around the remainder lake, back then, you didn’t know if you would be able to walk all the way around. Sometimes it was so wet and boggy at the far end, we would have to turn around and walk back again. Now there is a causeway and the adventure has been lost to the signs of progress and making life easier for visitors to the park. It’s still a lovely park to explore, especially if you take the trails less travelled. I still have fond memories of watching “Carry On Up the Jungle” being filmed next to the lake, with a rather sleepy crocodile that didn’t move much. On another visit, we saw a patrol of ‘German’ soldiers moving through the forest in search of prisoners (probably escaping the cast of that film). Burnham Beeches was wonderful, with ageing beech trees to explore, many you could hide inside too, watching passers-by undetected.I recall my mum warning us not to stay out late, especially here in Burnham Beeches. She had told us of strange things happening after dark, witchcraft and other devilish and occult stuff that we needed to keep well away from. As a teenager I certainly developed an interest in books by the author Dennis Wheatley (occult novels), was this due to the intrigue of Burnham Beeches, possibly. Many years later whilst in the witchcraft museum in Boscastle (fascination moi? ), I saw many strange things and read about those goings-on in Burnham Beeches – so they were for real and not just my mum getting me home in time for dinner! There were other forays into the wilds too, we lived in the New Forest for a while and I recall paddling in streams, watching the ponies and walks through the forest, and avoiding huge piles of poo, lovingly left by those ponies, next to our garden gate. Years later, my girlfriend and I went camping in the New Forest, our first night together in a small tent and this was followed by many more camps in the years ahead. The draw of wild places had already taken hold. So, it seems to me, that my formative years spent exploring and playing in the woods, those near to home and further afield, probably have a bearing on why I love to be in a woodland. Was it the solitude, the grounding in nature, the peace and quiet with just the birds to listen to, or the safety of a shelter and the protective branches of the trees above? Probably all of these and other things more primal, that only when in a woodland can really feel their presence. Just in case you were wondering about that picture at the top of this page – no it’s not me, it would certainly have been in black and white if it had been. 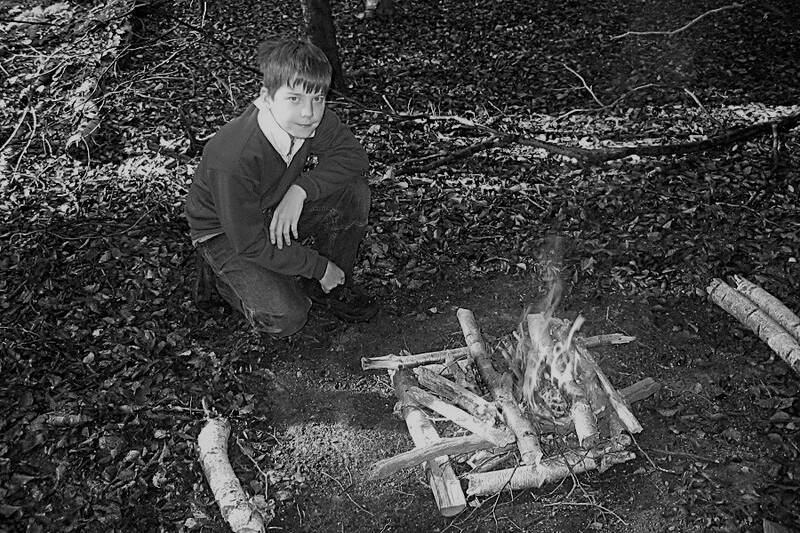 It’s of my younger son, having just helped me build a campfire next to our secret camp in the woods. He is now a man, taller and stronger than me, handsome too. Looking through many pictures, I felt that this could so easily have been me all those year ago, quietly sitting by the fire, and yes, I did get his permission to use this photograph! Thank you for reading this, i hope this provided some insight into why I love the woodlands. The story continues to unfold, and I intend to write some more. If you’d like to experience this first hand, then the best thing you can do is spend time closer to nature. If you’d like to join me for a guided woodland walk or learn practical skills in the woods; fire lighting, carving, campfire cooking and more, then please take a look at the Bushcraft courses and events I have on offer. For more story telling and announcements get David’s newsletter – click here! I too many many summer holidays building hideouts in the local fields and just like yourself, I spent many many weekends exploring Burnham Beeches and so swimming in the Lake at Black Park. Thank you Mark, great to hear that these places provide fond memories for you too! Substitute One Tree Hill at Langdon Hills near Basildon for Burnham Beeches or Black Park and that could be my childhood story too, David. Thanks Jeremy, it’s good to hear that you had fun in the woods as a kid too and as to those doors, well you just have to make use of whatever you are given and / or find!